Swap Pac-Man and Luigi: It's less about Pac-Man being that bad and more about Luigi and Chibi Robo being better. Luigi has even more ridiculous frame data, even more early kill confirms than even Pac-Man's Back-Throw (Up-Air to Up-B 50-50, Fireballs to Dair guaranteed, etc. ), Luigi's access to be able to abuse shieldgrab through going across half of FD from holding shield from the amount of traction luigi gains honestly benefits Luigi way too much than he should especially when his grab game is so good AND when he has one of the best punish games in the game. Chibi Robo's access to disjoints, much faster mobility, earlier kill confirms, and overall more reliability than Pac-man is probably enough to make him better than the Yellow Demon. Pac-Man's matchups are probably not good enough to be top 5, but anywhere in top 10 is fine. Luffy is a bit too high: While the 1.1 mechanics GREATLY benefit Luffy overall. Luffy still has a lot of neutral issues given his mostly poor frame data and very risky huge hurtboxes everytime he does an attack. While the grab change really helps Luffy with not getting consistently cut short by a jab or whatever when he uses side-b, Luffy still has big enough exploitable flaws to prevent him from being THAT high. Pikachu is WAY too low: Just because Pikachu has a little bit of Marthiritis sometimes and is a bit light isn't enough to place him that low especially given his advantage state. Pikachu's access to quick attack, moves with great frame data, fantastic mobility, and more allows for Pikachu to have one of the best neutrals in the game while possessing a fantastic punish game and the ever-so potent thunder which also grants Pikachu a fantastic offstage game and edge guarding while also having a great projectile which gains lots of distance while supplying enough hitstun for Pikachu to follow up. Also Pikachu's access to a short hurtbox REALLY benefits him in a combo based-meta like 1.1.0.1 more than it should and Pikachu just fundamentally works as a character. has pretty poor overall range in a game where range is pretty key (this also applies to Pikachu), and he lacks the serious versatility that Pac has. Pac still has bell confirms, an oppressive ledgetrap game, a special move that can set traps offstage, edgeguard, kill opponents or start combos just off an item throw. I feel like you may be overestimating Luigi a bit as he still gets walled out by disjoint characters even with Fireballs being a thing. I genuinely never understood why people think that 's command grabs are actual neutral tools, because they aren't. Rocket, Snap and Pistol are combo extenders - Rocket allows for vertical kills/juggles, Pistol opens up all the grab followups on the ground and Snap allows you to get grounded resets. Furthermore, Luffy still has some non-risky moves and his aim in neutral is conditioning the opponent to shield or to keep playing the crossup game so that he gets tomahawk grabs or the option to whiff punish on shield. Also, his recovery is very solid as Balloon has armour when he inflates and he has a few options when recovering low, especially with the grab changes. suffering from Marthritis isn't good when he's tiny and has poor range, especially with the grab changes. He's also big enough to be combo'd and he's light enough to die early from a combo. Considering how many disjoint characters there are ( , , , , , heck, even , and probably give Pikachu a bit of trouble) and characters without them who are more consistent ( , , , , , , , , , even , and etc. ), it hurts Pikachu's viability in the long run because of it. Doesn't Pac also have range issues as well, but anyways doesnm't matter? But I'd actually argue that you are underestimating Luigi. Luigi's main purpose isnt to approach but rather force the opponent to shield or attack through fireballs given how luigi can summon fireballs without consequences while having good enough frame data and traction-boosted grab to be able to basically attack the opponent at suprisingly far distances when the opponent chokes just a little bit. Also it helps that Luigi basically can get 60-80% off of one neutral-aerial exchange thanks to the quick frame data on all of luigi's moves (Up-Aerial LITERALLY has the same amount of startup as Neutral-Aerial now) basically meaning that Luigi when he touches the opponent once allows for a lot of dumb things to happen. Luigi actually doesn't even do that bad vs swordies and walling-based characters. While he can still get walled out in neutral sometimes, however due to the fact that most wall characters can't get out of disadvantage that easily ESPECIALLY when dealing with a character as oppressive as Luigi (Hell, his combo game is so good that its even scary vs characters like jigglypuff), the fact that Luigi can consistently force out fireballs can actually force some walling-based characters to actually shield a lot to prevent setups of characters like Pac-Man or allow Luigi to just approach with a grab and we all know how devastating that is. 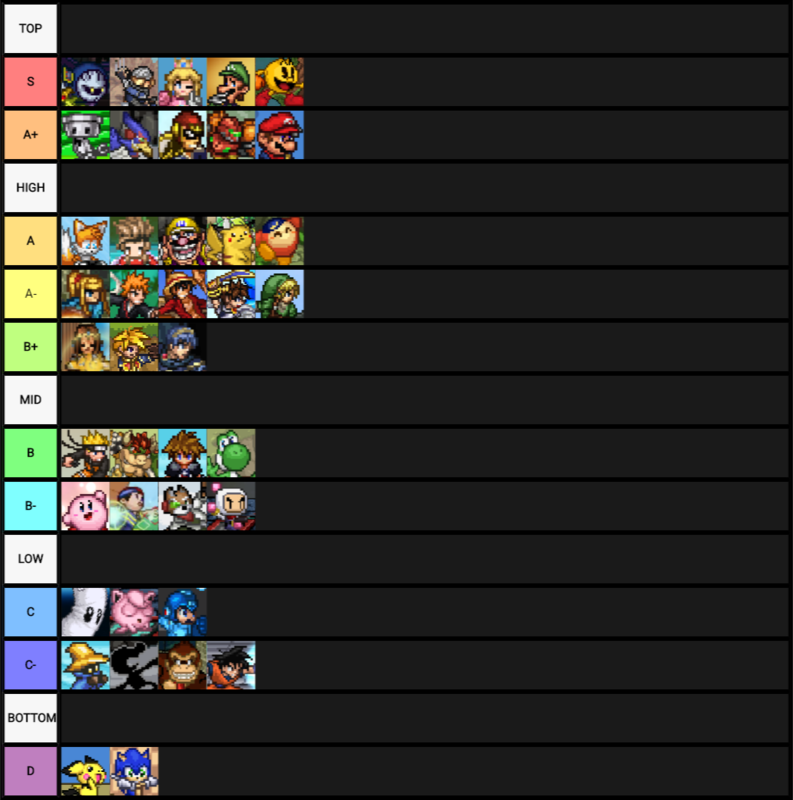 Most sword-based characters (Except for Meta-Knight because Meta-Knight is Luigi's worst matchup for a reason) pretty much have mediocre landing options at best or have pretty punishable frame data for a character like luigi meaning that finding openings really shouldn't be hard when luigi has access to two frame 2 moves with one of them being a decent anti-air and the other one leading into a stupid amount of damage. The fact that luigi can basically just get out of disadvantage easily with the single hit of an A button in the air while still having moves like luigi tornado to mixup his landing when being juggled ALONGSIDE Luigi being super hard to combo in general pretty much means that luigi usually isn't in a bad spot. Luigi I feel like also has more well-rounded matchups compared to Pac-Man since as great and oppressive as Pac-Man is, his matchup spread is actually pretty bad as he actually loses to quite a lot of High/Top tiered characters eventhough his matchups are 100x better than what they were last patch. Also Bell was nerfed sorta hard and usually most pac-mains like to use cherries/strawberries zdrop to up-smash or even turnaround throw orange to f-smash and of course back-throw for killing which is a lot more position based unless Pac-Man successfully lands a grab. Also I didn't say Luffy's command grabs were neutral tools, his main neutral tool (Neutral-Aerial) has a huge hurtbox while actually having suprisingly bad frame data (After doing some research) that was only backed up by its decent range which pretty much makes the move pretty easy to trade with and basically its linear enough where the opponent can just shieldgrab luffy a ton. Luffy mostly has an issue where his frame data is predictable enough while his hurtbox is big enough usually for him to be vulnerable to shieldgrab most of the time and given how Luffy is relatively easy to combo. While i'm not suggesting a huge drop, but the viability of shieldgrabbing I feel like might hurt luffy's gameplan a bit, also because Luffy has pretty bad matchups for a high tier character. Pikachu despite not having 100% reliable kill power, he still basically has access to Up-Smash and honestly anything to thunder alongside the fact that Pikachu has a fantastic edge guarding game. Pikachu despite this is a lot more consistent than most characters you mentioned. Pikachu overall has a fantastic neutral to always get that hit when he needs to regardless of the matchup while still having a devastating enough punish game to at least rack up the amount of damage he needs to feel comfortable with. Pikachu can very much kill under 100% when you trade with Up-Smash which actually happens a lot more often than what most people would usually think and he can actually oppress quite a lot of the cast. There's not much towards why Pikachu is so great, but it just sort of comes down to the design of Pikachu. Unless Pikachu got massive reworks or he REALLY struggles vs some characters or got his tools massively nerfed (like Melee Pikachu), Pikachu is mostly likely going to be high tier at worst. I don't see why Pikachu is being rated so high; while he certainly benefits from trading and he got a buffs here and there, his overall stage mobility was almost completely eliminated in the most recent update. Sure, he can jump out of a landing quick attack now, but in order to consistently execute any of the platform movement that was possible before, near frame-perfect inputs are required. In addition, Pikachu can't stop doing platform tricks anymore unless his opponent is all the way on the other side of the stage because when he jumps out of quick attack he has no horizontal momentum, a problem that didn't exist when quick attack could be ledge cancelled. I would also say that Pikachu is much better on FD now, too, but the side-B glitch stops him from making use of the quick attack buff in the first place. If Pikachu had his old up-b with all the other changes, then the current placement would make sense. I don't really know where Pichu should be placed, because it's torture playing both as and against him. I still think ZSS is still a directly worse version of Chibi, but that might be because of how awkward she feels since I'm so used to her pre-update version. Also Sheik's absolutely busted now with the lower short hop. Remove a character's one major weakness and the floodgates are opened. And finally, all weeb characters should automatically be Z tier. EDIT: After some thought, I realize that I exaggerated on exactly how bad Pikachu is; He's pretty good now, but I still don't think he's better than pre-patch Pikachu. New Pikachu is good, but far less mobile than old Pikachu. Part of the frustration came from my anger over the Up-B Glitch that I discovered after 5 mins of playing the game a couple weeks ago, and how I was mad that I made it through all of the play testing, and how I will have to wait months until it gets fixed, and when it does get fixed I'll have to get over the habit of jumping before every up-b. In conclusion, I think Pikachu's meh tier, and you either have to form a habit of jumping into an up-b on the first aerial frame, or you have to get bodied by the psychological trauma that comes from worrying about whether or not you've accidentally used side-b at any point whatsoever in that stock. Swap Pac and Falco, Mario with Lloyd, Bandana Dee With Bowser, Place Wario in B-, Swap Pichu and Sonic, Donkey Kong with Sandbag, and other minor adjustments and it's a surprisingly accurate tier list, good job for once. It's a little hypocritical for you to say that Sora is too high JUST BECAUSE of gimmicks because you know... 1.0.3.2 Pac. But anyways, Sora's gimmick isn't just a thing where he has a chance of laddering the opponent to death, but its rather because his up-air is so lagless and can be comboed into anything which compliments his bounciness such as Neutral-Aerial and even down-special as finishers. Sora is literally just a Mini-Meta Knight now and we know how good Meta Knight is in both Smash 4 and 1.1 but while he doesn't have TOO much to offer outside of that (Also grabs beat attacks so good luck dealing with flowmotion now), its a practical gimmick that works on all kinds of players alongside giving Sora a stupidly huge advantage over certain characters. This post has so much misinformation that its hilarious. 1. Sora's up air is not lagless by any stretch of the imagination, in fact, they actually increased it's endlag and landing lag in this patch. 2. Sora can now combo into Command Deck to finish sure, but that's cause it's literally his only good grounded kill move now cause the patch thoroughly gimped all his grounded attacks. Wait, what? Literally 2 of Sora's ground moves got nerfed. They weren't even big nerfs, Dsmash lost all of 10 KBG and Fsmash lost 5 KBG and 3 BKB. Sure, they kill slightly later now, but I can't imagine either of them going from good kill moves to bad ones because of those changes. 3. Flowmotion is not a command grab, in fact, it actually goes into helpless on shield so it's a free punish. P sure playridise was saying that Flowmotion would beat attacks because it acts like a grab, not that it is a grab. I have no clue if he's right about that, though (I'm guessing not, given how weird Flow is in general). 4. Sora is not remotely comparable to Meta Knight. MK's ladders are not a gimmick, they're a product of his design and his up air's speed and power. Sora's aerial spam s*** is a gimmick because the devs intentionally made it a thing and coded the counterplay into the move. Can't speak to SSF2 MK, but Sm4sh MK has an increased SDI multiplier on his Uair specifically so his ladders are escapable, which sounds very similar to what you're saying about Sora. Hell, the exact same thing is true of Bayo and she's still easily the best character in Smash 4. The existence of counterplay isn't really the part that matters, IMO. From a much older post, but I have to ask: Was his overall toolkit really nerfed that much? Besides the slight nerfs to his smash attacks covered above and a minor nerf to his spotdodge, he only really got slightly more lag on his aerials, which hasn't hurt his neutral or combo game much if at all. While Sora certainly got more gimmicks in 1.1, I don't see any reason why he'd be more reliant on gimmicks now than in 1.0.3.2. 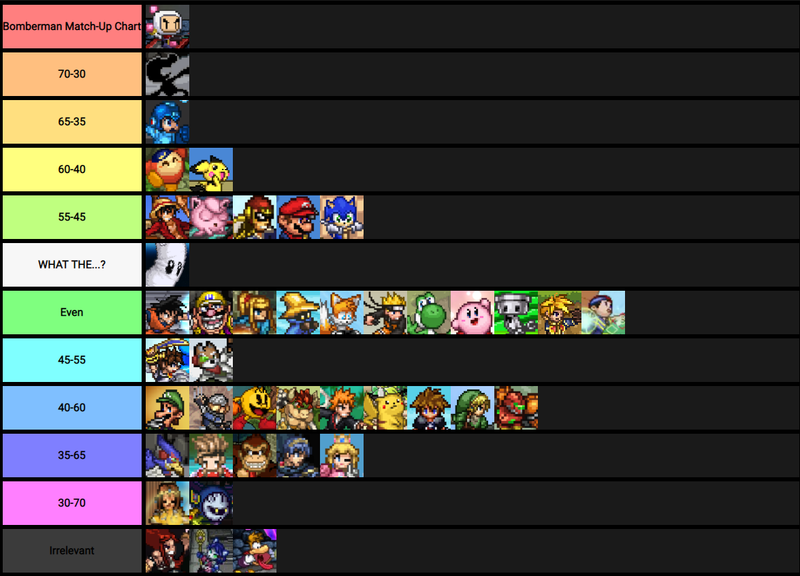 There is NO WAY that pichu (in ssf2) is bottom tier! Pichu is bottom tier. I used to think the same, but he just can't keep up. Same with Sonic. I don't hate Sonic, but he is garbage. he's just... meh, ok for me. I really think you guys are sleeping on Bomberman. His mobility and skillful bomb set-ups allow him to keep his distance against characters with better range or characters who can combo him easily. I'd even argue that Bomberman even beats the likes of Captain Falcon (though not by much) because Falcon struggles against a Bomberman that can play smart by knowing when to run away and start combos with bombs. Mind you that Bomberman is the 13th fastest character on the roster (12th if you remove Kaio-Ken Goku). People may argue that Bomberman gets combo hard, and that's true. But Bomberman can also combo other opponents almost just as hard and is capable of killing floaties as little as 35% on the upper blast-line with up-b. His recovery is linear and exploitable, but people overlook the fact that Bomberman is actually capable of recovering from the lower blastline (combined with his jump, of course), Sheik, Chibi-Robo, and Bomberman are the only characters I know who are capable of having that kind of a vertical recovery. You can buffer Bomberman's up-b at the absolute bottom of the blastline and most characters wouldn't really chase him off-stage for it because they'd die with him. Up-b still has it's flaws: any move that can trade with his up-b means that Bomberman is still forced to stay off-stage, meaning his off-stage game is still non-existent, though not 100% free. He's pretty much a glass cannon. And his Bombs are frame 1-2 (the explosion is frame 1-2, it takes 4+ to set them off), so Bomberman is really good at keeping his opponents on their toes. Bandanna Dee really isn't that strong against Bomberman. How can you space out a character that's literally built to keep his distance away from a huge margin of the cast. His disjoints and his edgeguarding prowess is a huge problem for Bomberman, but none of those really matter against a good Bomberman keeps stage control with his bombs. DK beats Bomberman from his range and touch-of-death combos alone, though bombs are still a huge problem for him. Bomberman can't lose neutral or he'll lose. Ness almost wins against Bomberman because of disjoints alone, but Bomberman's frame data is better than Ness' frame data (somewhat). DK tho can be easily edgeguarded and chaingrabbed by Bomberman. And BDee can avoid Bomberman's infamous grab game and edeguard him whenever he gets off stage, but has problems as well. Probably even. Chibi also beats bomberman easily,because of bomberman's terrible recovery and Chibi's infamous Dair killing him any time he goes offstage. Bomberman will get bombarded by Chibi-Blaster the entire time and may get spaced out by Chibi's disjoints and great grab game.